Jeremy Jenkins Credit. Click on map to zoom. Lochsa Slope Roadless Area is a 75,000 acre, roughly crescent-shaped swath running east-west parallel to the Lochsa River and Highway 12, which comprise the northern boundary of the wildland. 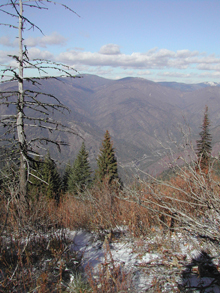 The area also hugs the Selway – Bitterroot Wilderness to the south, and is about 77 miles east of Orofino, Idaho. The elevation ranges from below 2,000 feet along the Lochsa to 7,500 feet at Tom Beal Peak. The western two-thirds of the Lochsa Slope are characterized by precipitous stream breakland dissected by steep side-drainages. At elevations above about 4,000 feet along the wilderness border and near the eastern boundary, past alpine glaciers carved cirque basins and scoured the mountains. Overall the topography is rugged, especially adjacent the Lochsa River where steep cliffs, rocky outcrops, and steep gradient streams create an unmatched vista. A diverse vegetation pattern covers the region with a dominant cedar-hemlock-pine ecosystem influenced by early 1900s fires. The area also includes larch, white pine, Douglas fir, grand fir, ponderosa pine, and impressive stands of mature western red cedar especially along the river from Warm Springs Creek eastward. On the glacial uplands at higher elevations, scattered conifer stands are punctuated with brush fields, and mountain meadows stretch alongside stream courses. Sheltered by the forest canopy are lady fern, pachistima, menziesia, beargrass, and grouse whortleberry, as well as sensitive botanicals like Mingan moonwort, clustered lady’s-slipper, Idaho strawberry, and Evergreen kittentail. The area contains thirteen major creeks that drain into the Lochsa River, providing high quality water and crucial spawning and rearing habitat for a large portion of the cutthroat and rainbow trout populations in the Lochsa River drainage. Furthermore, five of these creeks are an essential haven for steelhead and Chinook summer salmon, inland redband trout, and westslope cutthroat trout. Elk, moose, mule and white-tailed deer, mountain goats, mountain lions, and black bear find a veritable sanctuary here, with over 8,000 acres of key ungulate winter range. A large moose population is located east of the Warm Springs Creek drainage in the Elk Summit area, the latter identified as a pivotal region for calving, rearing, and ultimately the survival of the moose. Furthermore, lynx, harlequin duck, wolverine, fisher, and several sensitive amphibian species are sheltered within this extraordinary country. Lochsa Face is connected to Highway 12 by three pack bridges; trails traverse the interior, primarily following the main ridges, and provide access to the Selway – Bitterroot Wilderness. A small boundary adjustment on this proposed new wilderness excludes Jerry Johnson Hot Springs as it sees extremely heavy visitor use and is managed for such. Otherwise, the potential for solitude and isolation from human activity and development is exceptional. Cultural heritage sites include Nez Perce Indian trails, historic Forest Service locations, and prehistoric sites. The current uses of the Lochsa Face country are hunting, camping, horseback riding, and fishing, all of which would be enhanced with federal protection. 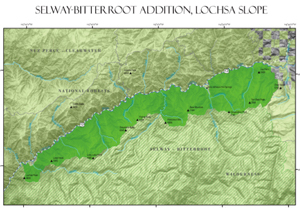 The addition of Lochsa Face to the Selway – Bitterroot Wilderness would be a natural, seamless, and logical addition. Doing so would ensure the continued integrity and fundamental ecological contributions of this irreplaceable wild country. Description of Other Roadless Areas on the Nez Perce – Clearwater National Forests.